In this section, we will add the image into the data grid view of win-form on the bases of certain conditions. In this section, we will add the image into the DataGrid View of WinForm on the basis of certain conditions. 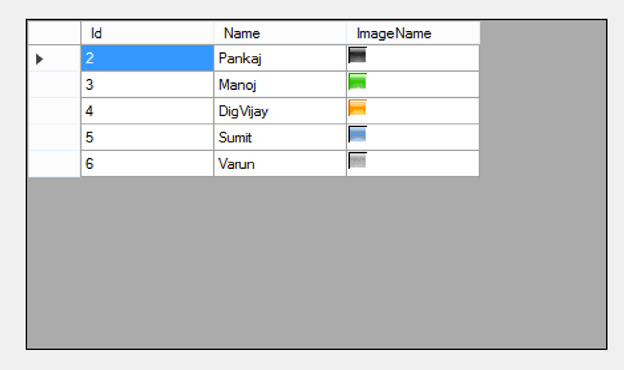 Here, we have used ImageList control for holding the images and DataGrid View control for displaying the image in the cell with the help of cellPainting() event of data grid view. Steps to add an image in DataGrid View control dynamically. Drag and drop the DataGrid View and the image list control over WinForm. Add the images to ImageList control. Create a sample data table for binding with the DataGrid View. Bind the DataGrid View with data table on the form load event. Use cellPainting() event of DataGrid View for adding the image over cell. /// This event fires when cell need to be draw, So over this event we will the the image control over the cell. // This image control use to place over cell with the help of drawImage function. // Check the column where we need to place the image. 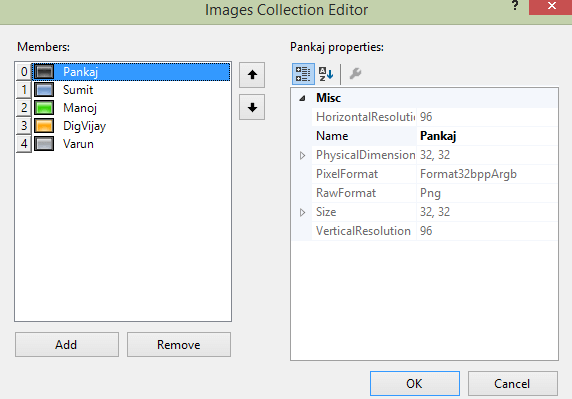 // On the bases of cell data, we will get the specific image from ImageList control. // Getting image from ImageList control "imageListOfMembers" and assiging it to image control "imgForGridCell"
// Draw the image over cell at specific location. dataGridOfImage.Rows[e.RowIndex].Cells["ImageName"].ReadOnly = true; // make cell readonly so below text will not dispaly on double click over cell.